Here is a no-nonsense guide to how you, the average American, can easily make clean energy and energy efficiency part of your daily life, saving money, making money, and weaning your community off fossil fuels in the process. Energy guru Brian F. Keane walks you through the cost-benefit trade-offs of the exciting new technologies and introduces you to revolutionary clean-energy products on the horizon, making the ins and outs of renewable energy easily accessible. 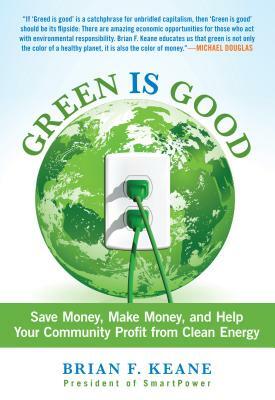 Featuring compelling, real-life stories that bring clean-energy problems and solutions from 30,000 feet to street level, Green Is Good walks you that last mile from awareness to adoption. It demonstrates how all of us can seize the opportunity and profit from it. Keane also discusses the challenges that clean energy faces, laying out time-tested strategies to overcome them. A renewable energy future isn't just good for the environment; it's good for the economy, and Green Is Good will show you how--before it's too late. Brian F. Keane is president of SmartPower. He appears on White House Chronicle and contributes regularly to the Huffington Post. Twice named Connecticut's Environmental Hero by the People's Action for Clean Energy, Keane speaks extensively with local and national media about clean energy and energy efficiency. He lives with his wife and their four children in Arlington, Virginia.